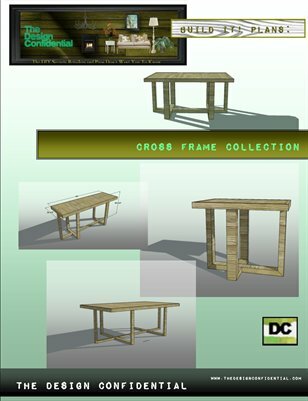 This Publication outlines the Step-by-Step instructions for building the Dining Table from the Cross Frame Collection. Extremely budget friendly and easy to build, requiring no special tools or skills. Anyone on any budget can build this. Inspired by pieces sold from a specialty retailer, this collection of build it yourself furniture is the perfect answer for those who prefer to avoid paying specialty retailer prices. !